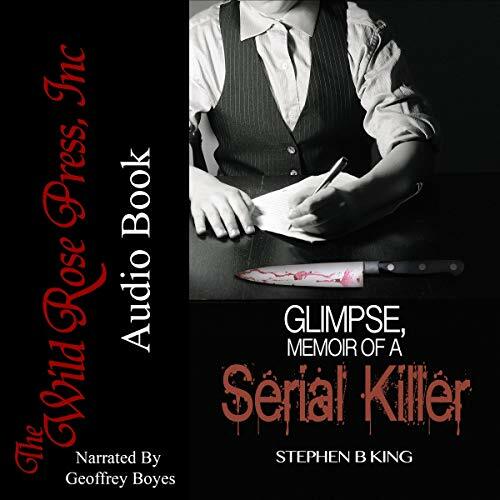 Glimpse, Memoir of a Serial Killer, Book 1, now on AUDIO! If I can be still living my dream at age sixty-three, so can anyone. I’ve told anyone who wanted to listen, and some who didn’t, that for all of my life I had a dream of being a published author. Now I know lots of people share that dream; and anyone who has signed a publishing contract knows what it feels like when that is achieved. In my case I reached that wonderful milestone at age 58 when my first book, Forever Night, was contracted to The Totally Entwined Group (Bonnier UK). So, you could say it took 58 years to become an overnight success. I’m 63 now, and who knows how many books are left in me before the grim reaper comes calling – lots I hope, but really, who knows? A good friend of mine said recently at a poker game that men between the ages of 55 and 65 are in the sniper’s telescopic sight, a sobering thought indeed. My tenth book is now in the editing stages with my wonderful publisher The Wild Rose Press (NY) and I have to keep pinching myself to make sure I’m awake. Yes, I know that’s a cliché and authors should never use them, but in this case, it’s true. Very recently Book 1 of The Deadly Glimpses trilogy, Glimpse, Memoir of a Serial Killer, was released on audio, and while this is my second audio book, it was much more involved in production than my first (Thirty-Three Days) due to the subject matter. The point is, that it is another example of me being lucky to be ‘living the dream’ I’ve had all my life. It’s important to me that I don’t trivialize any of the rungs on the ladder I’ve climbed, or bucket list things I’ve ticked off, so please believe that this book coming to audio is one of those, OMG moments in time for me. To try to put this into context, from writing the first line of this book [“I was five years old when I first saw someone bleed out”] to the audio release took over a year. In that time I performed rewrites galore, worked with two editors, which meant six editing rounds. So, safe to say I know every word off my heart. We were very fortunate to snap up the wonderful narrator Geoffrey Boyes who did Thirty-Three Days for us; he read the book and volunteered to do the whole trilogy, because he loved it so much. So then I worked with him, listening to his work, and offering edits and suggestions. An example of his dedication to his craft was that he was concerned he had to get the Serial Killer just right and he did three different characterizations and sent them to me for my approval. Slowly the project came together. When it was released, I bought a copy from Audible.com. I didn’t have to, I had the files, but I did, and then spent the next few days listening to it on my long drives to and from work. I don’t want to sound in any way conceited, but……….. It gave me goosebumps. Geoffrey’s portrayal of all the characters, but of PPP, the murderer, in particularly, still makes the hairs on the back of my arms raise up. I wrote the story, I knew what was coming next, but can I say in all truthfulness, listening to it was fantastic? Because so much of the book is in memoir form, Geoffrey had to distinguish between what the killer thought (and wrote) and what he said in dialogue, and he nailed it. There were a few occasions I arrived at my destination, but had to keep listening because it was exciting. Sure, I get that for many people, this story isn’t their cup of tea. A romance lover may not want to read about a serial killer, even though there is a very distinct love story across the three books. I don’t know how many people will read, or listen to the book, but for me, this blog post isn’t about that. I’ve brought up five children, and for all their lives I’ve tried to teach them to dream high, never give up, never stop trying and never listen to the people who would try to stop them reaching their goals. If I can be still living my dream at age sixty-three, so can anyone. My kids are proud of me, and I can take that to my grave with a smile on my face. What are people saying about Glimpse? Detective Sergeant Richard “Rick” McCoy of the Australian Police Department is struggling to deal with the fact that his wife discovered he cheated and threw him out leaving him missing both his wife and five year old daughter Amy. Rick knew that he was to blame for his marriage falling apart but when he is assigned to a murder of a woman found in pieces in a suitcase in the rubbish dump he has no idea how his life will change. This is not the typical story of who done it but it is a story told in detail by the serial killer himself. The killer’s dad was a butcher whose wife left him and her son when he was just five. As a young boy he would watch as his father butchered meat and found himself fascinated by the sight of blood but just before his twelfth birthday he discovered his mother didn’t leave but was lying dead inside his dad’s freezer and his dad was lying in a pool of blood after killing himself. In spite of the fact that his dad beat him, he loved him but now he was put into an orphanage where his dad’s beatings were nothing compared to what he suffered there. When his uncle finally took guardianship of him he learned what real abuse was because his uncle was a pervert and a homosexual who used him till he was eighteen. Instead of trying to go back to the orphanage he chose to stay with the monster he knew and not risk finding himself with a worse one. Rick is trying to find the killer but there are no clues, no fingerprints, nothing to lead them to him. The only good thing that happened for him was he was reunited with his wife and child and this time was determined to change and be the husband his wife deserved. As time went by the case was cold but the killer was far from done and a finger is sent to Rick at the station with a note threatening to remove a body part every two days if Rick didn’t catch him, the note is signed PPP. The note was addressed to Rick personally and in time his connection with the killer would be revealed, but not by me. Patricia Holmes a forensic psychologist is enlisted to help and she seems to have an uncanny insight into the killer but more are dead and they are no closer to catching him. This story is not for the weak of heart because some of the very explicit violence can be disturbing to say the least. The hunt for the killer is done so well that I could not put the book down. Although this is fiction it is scary in the fact that we know that monsters such as this exist and we have had our fair share in the United States. I was hooked from the first page and watched as the killer was tormented his entire life and although I found myself feeling sorry for him at times I don’t believe that how you grew up is a cause for what you become when you are an adult. I can’t wait for the next book in the series and hopefully the wait won’t be too long.